An American soldier is reported to have "stalked from home to home" before dawn, then methodically killed at least 16 civilians including 9 children, and 3 women. One of the dead appears to be a girl of toddler age. 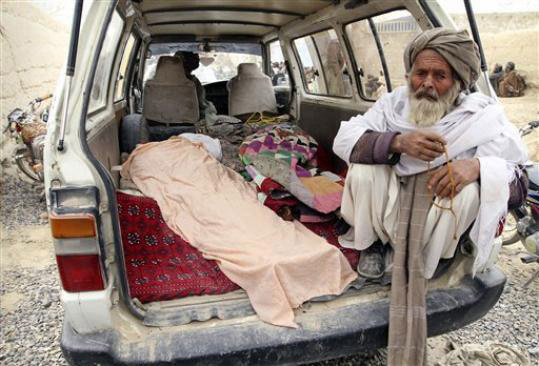 The incident took place in a rural community in southern Afghanistan on Sunday morning. Eleven of the victims were members of one family. Photographs of the bodies circulating online show bullet wounds to the head, execution-style. Five or more additional civilians are reported to have been seriously injured. "It is not the first time US soldiers have intentionally killed Afghan civilians but the death toll is unprecedented for a single soldier." A tiny girl in a red and green dress, is she 2 or 3 years old? There's a single gunshot in the middle of her temple. She almost looks asleep. The killer in Kandahar is described as a "conventional US soldier" by ISAF sources, i.e., not Special Forces. Reuters and locals saying more than one solider involved, but ISAF insisting that this was an "individual acting alone". From ex-US diplomat,"If you're an Afghan, you've seen a Florida pastor try to burn a Koran, then Marines urinate on dead Taliban soldiers, then burning of the Koran, and now this... all within 10 months. We don't have the benefit of the doubt. Time for us to get out of there." Is the international mission here in danger of losing its most important supporter... the Afghan people? More: NYT, CSM, CNN, Reuters, AFP, AP, Guardian.